Why not just give all students free breakfast and lunch? It’s not easy to think on an empty stomach. It’s not easy to fill out worksheets or bubble in multiple choices or listen to the teacher drone on about fractions when your stomach is rumbling. That’s the thinking behind the federally-funded National School Lunch Program and the School Breakfast Program: Currently, for example, kids from a household of three that makes less than $25,389 qualify to receive free lunches and breakfasts at school, and a household of three making less than $36,131 qualifies for reduced-price lunches. But in many schools, there’s a stigma to getting free lunch. The other kids know what getting free lunch says about their family, so some don’t want risk the social consequence. “I know a lot of kids that don’t even eat at lunch because of that,” says Danny Postlewait, a red-haired high-school student sitting at the lunch table at Rogers. So instead, he says, kids that don’t have a lunch from home and aren’t willing to get free lunch, just sit there, and go hungry. At Rogers, the free-and-reduced lunch levels are over 76 percent, but the two middle schools that feed into it both have rates in the 80s. Doug Wordell, director of nutrition services for Spokane Public Schools, says that indicates that students are less likely to take free or reduced lunch as they age. But there may be a solution. In 2007, the entire Sunnyside district in the Tri-Cities area, which we profile in this week’s Inlander, took advantage of a federal provision for extremely high poverty schools to give every child free lunch and breakfast, every day. With aid from the federal government and without the cost of tracking the paperwork on every student who qualified, they actually saved money. So can’t Spokane schools do the same? Wordell says it’s not that simple: Not every school has a high enough free/reduced lunch rate to qualify for such a program, and it’s even more complicated in a large district like Spokane. But next year, the “Community Eligibility Provision” of the Healthy, Hunger-Free Kids Act goes into effect in Washington state. This provision is different from the one that Sunnyside uses, and will make it easier for many schools — or groups of schools — to offer free meals for all students. About 4,000 schools nationwide already use it. Think Progress reports that Indianapolis public schools just started offering free meals, and cite several studies that show major successes in other districts that have tried it. If Spokane adopts the CEP provision, the district predicts quicker serving times, shorter lunch lines, less paperwork and, most importantly, fewer students who are told, ‘sorry, you won’t be able to eat today,’ when their balance runs out. 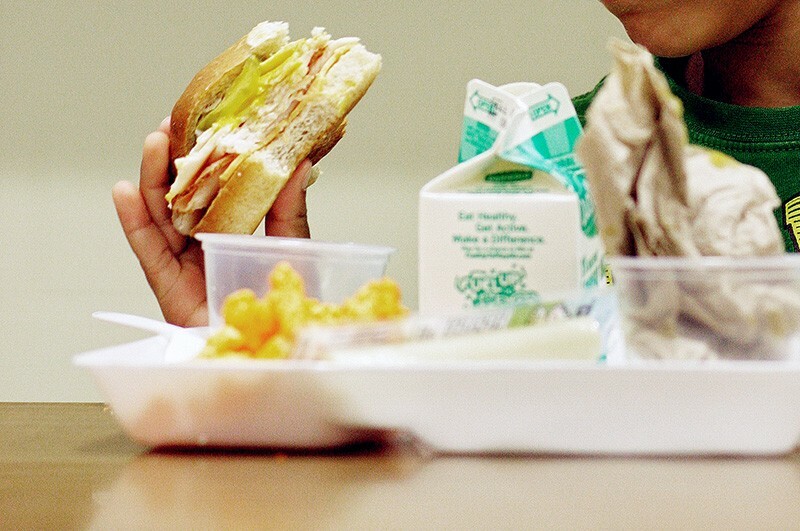 Any school with at least 62.5 percent of its students identified as “low-income” will have its meal program completely compensated with federal funds. Spokane Public Schools is considering allowing every school with 50 percent or higher low-income students to be a part of the group. That data, the free and reduced lunch rate, has become a vital figure local education reporters use to write stories — it’s a quick way to see the extent of poverty in a given school. • Learning Assistance Program funds, which gives assistance to kids struggling in reading, writing or math. “I think principals are pretty invested in the data,” Wordell says. So for schools that take advantage of universal meals, Spokane Public Schools has designed a “Family Economic Survey” to gather the same sort of data. The question, however, is how many will actually complete it. “Since this is no longer required to be filled out for the child to eat, we realize that we have lost a significant incentive for parents to fill it out,” said a letter from the district’s Nutrition Services. That could include North Central and Rogers High School, all but one middle school, and many elementary schools. outlined to local schools. That’s been a challenge for Sunnyside, too — communicating just how crucial it is that parents send back the information.